Arguing in favour of renewed critical attention to the 'nation' as a category in art history, this study examines the intertwining of art theory, national identity and art production in Britain from the early eighteenth century to the present day. The book provides the first sustained account of artwriting in the British context over the full extent of its development and includes new analyses of such central figures as Hogarth, Reynolds, Gilpin, Ruskin, Roger Fry, Herbert Read, Art & Language, Peter Fuller and Rasheed Araeen. 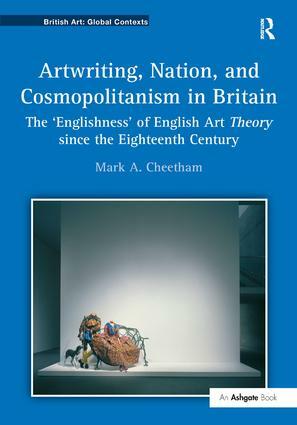 Mark A. Cheetham also explores how the 'Englishing' of art theory-which came about despite the longstanding occlusion of the intellectual and theoretical in British culture-did not take place or have effects exclusively in Britain. Theory has always travelled with art and vice versa. Using the frequently resurgent discourse of cosmopolitanism as a frame for his discourse, Cheetham asks whether English traditions of artwriting have been judged inappropriately according to imported criteria of what theory is and does. This book demonstrates that artwriting in the English tradition has not been sufficiently studied, and that 'English Art Theory' is not an oxymoron. Such concerns resonate today beyond academe and the art world in the many heated discussions of resurgent Englishness. Contents: Introduction: Artwriting and national identity (or, no theory please, we're English); Englishness, foreignness, and Empire in British artwriting, c. 1700-1900; Indigenes, imports, and exports: Englishness in artwriting from modernism to the 21st century; Bibliography; Index. Mark A. Cheetham is a professor of art history at the University of Toronto. He is the author of eight books on modern and contemporary art and has won several international awards. British Art: Global Contexts provides a forum for the study of British art and visual culture in the global context from 1700 to the present day. The main focus of the series is threefold: the transport, location, and reception of British art across the world; the British reception and exhibition of art from around the globe; and transnational and cosmopolitan art containing significant British components. The series seeks to problematize, historicize, and specify the idea of British art across the period, as it intersects with local, regional, international and global issues, communities, materials, and environments. Specializing in studies of British art within comparative and interdisciplinary frameworks, the series includes monographs and thematic studies, and single authored works and edited volumes of essays. The series publishes research which deals with fine art objects and the broader visual and material cultural environment of Britain and its historical territories, as well as with the global diaspora of British artists, genres, artefacts, materials and styles, and the contribution to British art of other global diasporas.